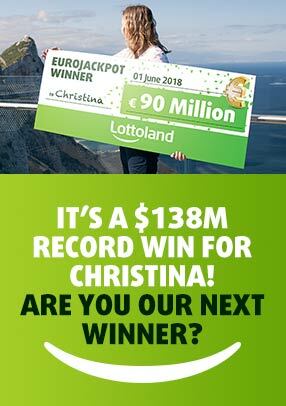 Next draw: 24/Apr/2019 12:30 in Vienna, Austria - $1.5 million in the jackpot! Next draw: 23/Apr/2019 15:00 in Madrid, Spain - Ƀ2,220 in the jackpot! Next draw: 23/Apr/2019 18:00 in Brasilia, Brazil - $460,000 in the jackpot! Next draw: 22/Dec/2019 03:00 in Madrid, Spain - $3.5 billion in the jackpot! Next draw: 06/Jul/2019 06:30 in Madrid, Spain - $181 million in the jackpot! Next draw: 06/Jan/2020 05:00 in Madrid, Spain - $948 million in the jackpot! Next draw: 26/Apr/2019 13:00 in Helsinki, Finland - $95 million in the jackpot! Next draw: 23/Apr/2019 14:30 in Paris, France - $66 million in the jackpot! Next draw: 23/Apr/2019 10:55 in Gibraltar - $66 million in the jackpot! Next draw: 24/Apr/2019 13:30 in Paris, France - $18 million in the jackpot! Next draw: 23/Apr/2019 13:00 in Wiesbaden, Germany - $1.504 million in the jackpot! Next draw: 24/Apr/2019 12:00 in Saarbruecken, Germany - $15 million in the jackpot! Next draw: 25/Apr/2019 09:15 in Hong Kong - $12 million in the jackpot! Next draw: 24/Apr/2019 14:45 in Dublin, Ireland - $4.8 million in the jackpot! Next draw: 23/Apr/2019 10:33 in Warsaw, Poland - $1 million in the jackpot! Next draw: 23/Apr/2019 10:35 in New York, USA - $10 million in the jackpot! Next draw: 31/Dec/2019 16:00 in Brasilia, Brazil - $100 million in the jackpot! Next draw: 23/Apr/2019 14:40 in Warsaw, Poland - $110,000 in the jackpot! Next draw: 24/Apr/2019 18:00 in Brasilia, Brazil - $30.6 million in the jackpot! Next draw: 23/Apr/2019 22:00 in Atlanta, Georgia, USA - $257 million in the jackpot! Next draw: 24/Apr/2019 21:45 in Mexico City, Mexico - $16.2 million in the jackpot! Next draw: 23/Apr/2019 15:30 in Warsaw, Poland - $60,000 in the jackpot! Next draw: 23/Apr/2019 14:40 in Warsaw, Poland - $1 million in the jackpot! Next draw: 24/Apr/2019 22:00 in Tallahassee, Florida, USA - $201 million in the jackpot! Next draw: 24/Apr/2019 14:30 in Johannesburg, South Africa - $6.4 million in the jackpot! Next draw: 23/Apr/2019 14:30 in Johannesburg, South Africa - $1.8 million in the jackpot! Next draw: 27/Apr/2019 05:30 in Sydney, Australia - $5 million in the jackpot! Next draw: 28/Apr/2019 15:00 in Madrid, Spain - $8.7 million in the jackpot! Next draw: 23/Apr/2019 13:00 in Rome, Italy - $212.1 million in the jackpot! Next draw: 24/Apr/2019 11:15 in Switzerland - $20 million in the jackpot! Next draw: 25/Apr/2019 13:00 in Gibraltar - $50 million in the jackpot!